China’s approach to this year’s Dialogue is communicating a simple message. China’s deployment of the HD-981 oil rig to drill in Vietnam’s EEZ waters has once again ratcheted up tensions in the South China Sea. This move is seen by many commentators as the latest example of Beijing’s increasingly assertive approach to its regional interests. From the late 1990s and through most of the 2000s, China executed a regional “charm offensive” seeking to develop good relations with all of its immediate neighbors. Since around 2009, however, Beijing has brought this phase to an end, hardening up its attitude to regional disputes, robustly contesting its claims and more generally taking a tougher stand towards the existing regional order. The oil rig deployment is the latest in a long line of incidents across Asia showing an increasingly assertive China muscling up and destabilizing the existing regional arrangements. But China’s approach to the region is more complex than the move from moderate to assertive implies. Harvard University China watcher Alastair Iain Johnston has argued that Chinese diplomacy throughout the 2000s was not always particularly charming nor is Beijing’s assertiveness especially new. Equally, and contrary to more recent assessments characterizing Chinese grand strategy as clumsy and counterproductive, we argue that China’s current foreign policy approach is often smarter and more sophisticated than Beijing’s leaders are given credit for. A prime example of this is Beijing’s approach to the upcoming Shangri-La Dialogue (SLD) in Singapore. 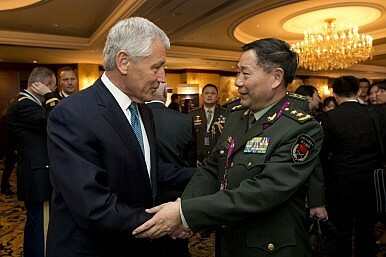 An invite-only affair attended, in the words of one Asian correspondent, by the “Spielbergs and Clooneys of military power” the SLD is an annual gathering that provides an opportunity for Asian defense ministers, officials, and policy pundits to exchange views on all matters security. This year’s SLD is particularly provocative to Beijing because Japan’s nationalistic Prime Minister, Shinzo Abe, has been given center stage as the dialogue’s keynote speaker on its opening night. At a time of heightened tension between China and Japan, Abe’s address is unlikely to pull any punches. He has already likened China’s actions in the South China Sea to Russia’s invasion of Crimea and has explicitly stated that the region is facing a 1914 moment. More pointedly, he is loosening longstanding limits on Japan’s military power with the aim of “standing up” to China. There had been some speculation that Beijing may boycott this year’s SLD in protest at Abe’s appearance. At one of the earliest SLDs in the early 2000s, for instance, Chinese representatives staged a walkout in protest against Taiwanese participation. Rather than getting rattled this time round, Beijing is instead reportedly sending along a large delegation that includes one of its leading lights – Madame Fu Ying. Currently Chair of the Foreign Affairs Committee of China’s National People’s Congress, Fu Ying was the poster child of China’s supposedly softer, more nuanced approach to foreign policy during the 2000s. Fu Ying has gone toe-to-toe with Tokyo too, earlier this year publicly criticizing Japan’s militaristic past and its inability to atone for it. In Madame Fu, Abe faces a formidable opponent. Indeed, his SLD appearance is not without risks. Despite Japan’s ongoing efforts to counter Chinese influence by upping its own Southeast Asian engagement, this is a part of the world that remains nervous about the prospects of a remilitarizing Japan and its impact upon regional stability. But what, if anything, does Beijing’s approach to the upcoming SLD tell us about the current trajectory of Chinese foreign policy? It reveals a China that is engaged with the structures of the existing order but which is unwilling to buy into that order in any significant way. Although hosted by the International Institute for Strategic Studies (IISS) and thus nominally independent, Beijing sees the SLD as a reflection of the status quo and thus reinforcing of America’s regional dominance. In its move from being a reluctant participant sending low-level delegations, prone to clumsy acts, to this year where its sizeable contingent will include the heavy hitting Madame Fu Ying, we see a China making good on its ambition to find space to operate free from the constraints imposed by the status quo. In its approach to this year’s Dialogue China is communicating in a sophisticated way a simple message. It wants a different regional order than the one that currently exists. And it is increasingly willing and able to seek that place for itself on its own terms. Nick Bisley is Executive Director of La Trobe Asia at La Trobe University. Brendan Taylor is Head of the Strategic and Defence Studies Centre at the Australian National University. They are each attending the 2014 Shangri-La Dialogue. Is China-Philippines Bilateralism on the South China Sea Going Anywhere? Fidel Ramos' "Track II" overture maintains steam, but can bilateralism lead to a positive outcome?